There are many ways to knit a sweater (probably as many as there are ways to knit! ), but one of our favourite construction methods is knitting from the bottom up. 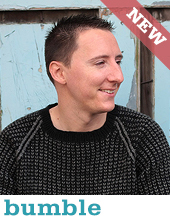 All of the sweaters in the Heart on my Sleeve collection are worked this way, as well as many other TCK sweaters. If you are looking for a tutorial on a bottom up cardigan check out our Antler tutorial here. To make a pullover from the bottom up, you knit with 3 tubes (2 sleeve tubes and a body tube), then you join them all together for the yoke. Sounds simple right? It is! Here are some photos to help you on your way. Your sweater will look like three tubes; two sleeve tubes and a body tube. Your sleeves will have the underarm sts on one piece of waste yarn and all other sts on a separate piece of waste yarn. Before starting the joining round you must put all sleeve sts except the underarm stitches onto needles (so they’re ready to be worked). For the Heart on my Sleeve sweaters you will also have one set of underarm sts on hold for the body (this is the right underarm). Knit across the remaining body sts (this is the front). The right underarm sts from the body are already on waste yarn. Place marker (this is your new beginning of round, located at the back right shoulder, between sleeve and back stitches). Steps 1 and 2: Once you have knit across half of your body sts (minus the underarm sts) you will place underarm sts on waste yarn. Step 3: Next you will knit across the sleeve sts. You will repeat this process (knit across body sts, then knit across sleeve sts) once more. Then re-place your BOR marker. This method locates the BOR between right sleeve and back stitches. Once joined, you will still have 2 sets of sts on waste yarn at each underarm, to be joined with a Kitchener stitch once the yoke is complete. Check out our tutorial on those pesky underarms for details on how to seam them together. This is what the underarm looks like while you complete the yoke. Voila! You are all ready to knit yourself a yoke. I worked the Ironheart yoke, a lovely bit of garter and lace. Do you have any resources for knitting your Flax sweater bottom up? Hi Kelsey – not specifically, but we do have a tutorial on bottom up sweaters in general here that might be useful. Can you please make a tutorial for top-bottom sweater sleeve-body separation? I’m having a lot of trouble picturing how it works after reading many patterns. 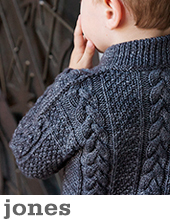 This tutorial is really helpful and I’m finishing up a toddler sweater now! 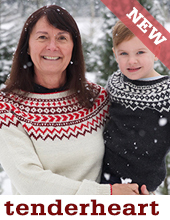 Hi Kimmy – I’m not sure exactly what you mean by a nordic type pullover, are you looking for one with the steek at the arms etc? Try Dale of Norway, they might have what you are looking for. Otherwise there is always Ravelry! This blog says nothing about yarn, needle size, weight, how many to cast on, sizes, etc. That’s right, it’s not a pattern, it’s a tutorial on the bottom up sweaters in our books (like Heart on my Sleeve), which have all the info on yarn, needles, sts etc.